Donut can also do all of these things with other stakeholders, like managers orbuddies, keeping them in the loop and helping them onboard the new hire more effectively. First you (or whoever is running an onboarding program) set up a standard Template of Messages for your new hires on our site at donut.ai. Then, when you have some new employees starting, you go to donut.ai and add them as New Hires. Donut takes care of the rest! Your new hires don't need to do anything — Donut will start sending them messages in Slack based on the Template you created. Once Donut is installed, sign in at donut.ai via the “Sign in with Slack” button. 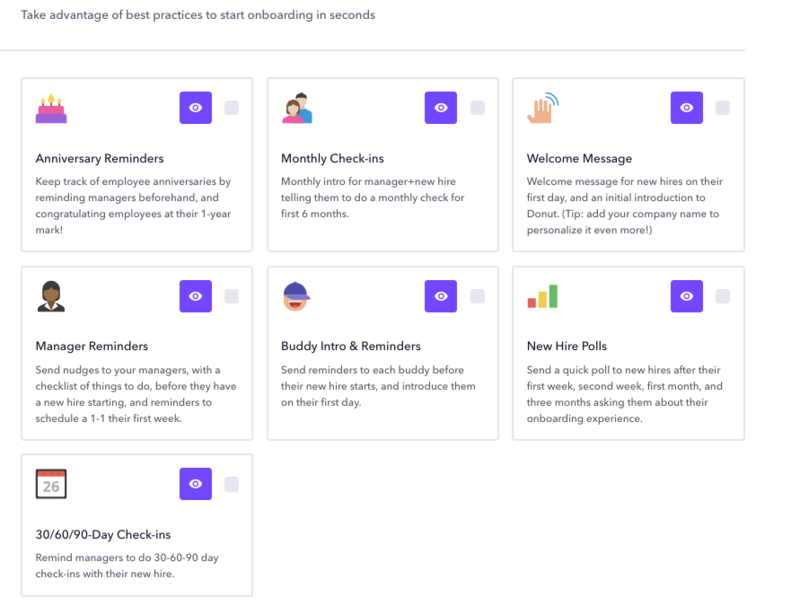 An Onboarding Template is a series of saved Messages, which are the messages Donut will send to your new hires and other stakeholders. You can create different Templates for different purposes, but you'll need to have at least one to get started. You can select from our onboarding best practices, or you can start a blank template that you'll manually fill in. Name your Template, add a description if you'd like, and hit "Create". If you selected from our onboarding best pracitces, messages will already be added to the template (you can always customize and add more). Use the "Add Message" buttons on individual days to add your own Messages. When you choose the settings for a Message make sure to assign it to your Template(s). You'll also find some pre-existing Templates already in there (any Template that says "Created by Donut Team") — use those as examples and for inspiration! Go to New Hires in the left navigation and then click the purple Onboard New Hires button. ...and add any other stakeholders, like their manager or onboarding buddy. When you're done hit "Add New Hire." That's it! Now all of the new hires and other stakeholders you've added will receive all the Messages according to the Templates that you assigned them. Each time you have new hires starting, just add them from the New Hires tab. Other people at your company who are involved in onboarding will want to create their own Templates to help out with the onboarding process. This might include HR, L&D, Operations, IT, managers, and department heads. Also read about Company Vs. Team Onboarding. You can give others access to collaborate on Donut and build Templates by adding them as onboarding Admins on donut.ai. And don't forget to send them this guide to help them get started!